Yesterday I was tremendously lucky and stumbled across a razor collection that was being liquidated at a local antique mall. There were roughly 300 straights, but I settled on the only one that made my heart stop. A gorgeous Filarmonica 12 with red scales. 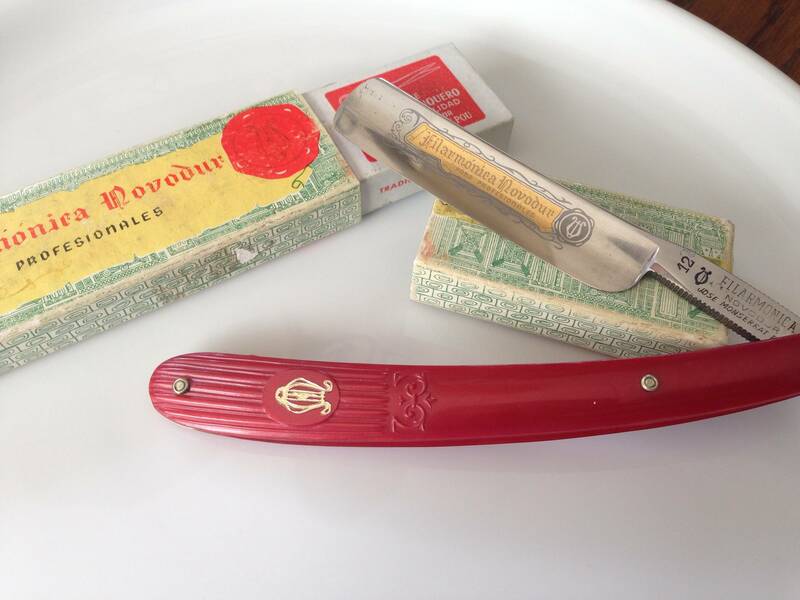 When I bought the razor all I knew was that filarmonica was a well respected brand. The shop wanted 125 for the razor alone, I haggled them down to 95, and asked if I could dig around to see if I could find the case. After 20 minutes of digging and a bit of negotiating I had acquired the case as well. All told it cost me $100 bucks, which at the time I had no clue if it was a good deal or not. So without further adieu... A pic of this lovely razor. A very nice razor those Novodur Para Professionals are great shavers I have the big Brother of yours the 8/8, they are also very easy to hone. (04-19-2014, 10:34 PM)Jamie Mahoney Wrote: A very nice razor those Novodur Para Professionals are great shavers I have the big Brother of yours the 8/8, they are also very easy to hone. I am scared to death of honing this guy, it would be awful to ruin the edge. I actually went back and under some great supervision snagged a dubl duck satin edge, which will be the first straight I learn to hone and shave with. Yes you are right about ruining the edge If you have little knowledge of honing then send both those razors out and have them professionally honed. (04-20-2014, 12:06 AM)Jamie Mahoney Wrote: Yes you are right about ruining the edge If you have little knowledge of honing then send both those razors out and have them professionally honed. Hey Jamie - I just stumbled across your honing video, which is a fantastic video, and I think I have the majority of the materials and skills required to hone the dubl duck at a mimnimum. Currently I have a set of 220, 1k, 5k, and 8k stones + dmt to sharpen my chef knives. If I managed to source a good strop do you think that grit progression would be sufficient or should I source a 12k stone as well? I am assuming that the straights are set down on the edge of the spine when you sharpen them as opposed to hovering like you do with a knife. Is there a reason you don't debur between the stone progression? Is there a good way to tell if a bevel has been set, or if the straight is NOS? Until Friday I thought I had shaving all figured out and then I had to make the mistake of buying my first straight.... What have I done !?!? If you have a 1K 5K and 8K and both those razors you have are two very easy razors hone in my opinion I would tape both those razors and give them 30 light laps on the 1K 5K and 8K then strop them you never know you may be lucky and they just might shave OK.
(04-20-2014, 06:31 AM)Jamie Mahoney Wrote: If you have a 1K 5K and 8K and both those razors you have are two very easy razors hone in my opinion I would tape both those razors and give them 30 light laps on the 1K 5K and 8K then strop them you never know you may be lucky and they just might shave OK.
Would it be better to just wait and get a 12k naniwa? 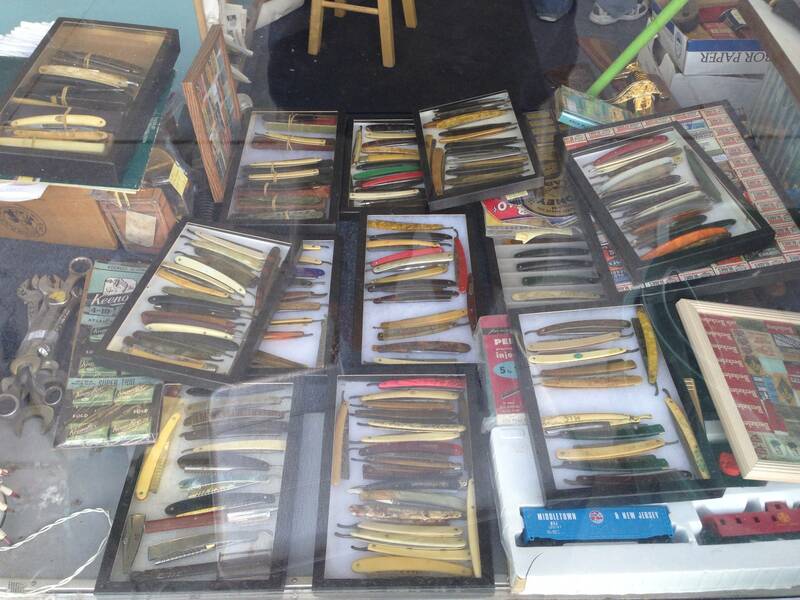 Here is the mass of razors I saw through the store front. And a pic of the satin edge with a wedge I snagged for a buddy. 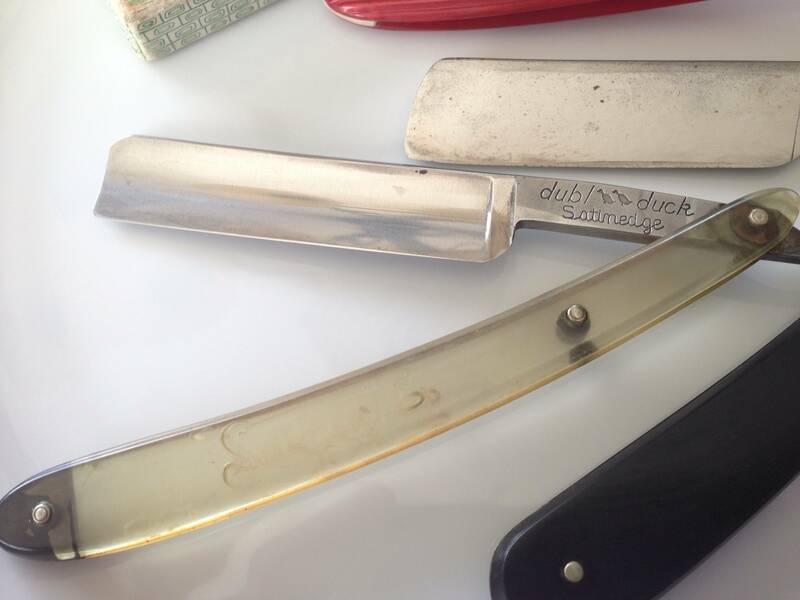 Yes you would be better off waiting to pick up the 12K Naniwa, looking at the Dubl duck that looks like it would be pretty easy to hone, I wish every razor that came in for honing looked like that one. Oh and don't underestimate that dubl duck. I have a dd dwarf and it is, in my opinion, a darn fine shaver that takes a very nice edge. Wow, what a find. If these razors don't trigger a newfound love for straights, nothing will. Enjoy. Wonderful! You are a men of luck. Congratulations! (04-20-2014, 11:31 AM)evnpar Wrote: Wow, what a find. If these razors don't trigger a newfound love for straights, nothing will. Enjoy.